University Park owes its beginnings as a neighborhood in the mid 1880’s to University of Denver (then Colorado Seminary) leaders who envisioned a college environment and surrounding community founded on the concepts of “conscience and culture,” far from the school’s location in bustling downtown Denver. The generosity of a potato farmer and a bishop’s wife helped the dream take shape, and the availability of transportation boosted chances that the community would become reality. 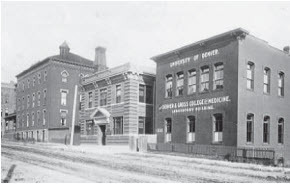 Colorado Seminary, founded in 1864 and reorganized as the University of Denver in 1880, had been operating downtown at 14th and Arapaho St. when trustees decided that the busy urban center was no longer suitable as an academic center. Mrs. Elizabeth Iliff Warren, wife of Bishop Henry Warren, pledged $100,000 to the school if it were to relocate to an area far from the “unsavory” influences of central Denver. Various sites were looked at, and trustees settled on the present location, envisioning it as a bucolic, educational enclave. Seminary president John Evans supported this choice, realizing that his Denver and New Orleans railroad sliced through the area, and could provide transportation to students and potential home buyers as well as bring in supplies without a long wagon haul. In 1885, farmer Rufus “Potato” Clark owned much of the land now occupied by the University of Denver (DU) and University Park. He agreed to donate 80 acres to DU if the school erected the main buildings as soon as possible, platted 200 acres as a town site within six months, and planted 1,000 forest trees along the streets and in parks. Ten additional owners promised to deed 70 more acres and additional cash to the university if these stipulations were met. University Park was dedicated on Arbor Day in 1886 as University Park Colony, lots were platted, and the vision of an elite community surrounding the university began to take shape. Early marketing required that “strangers to us” needed recommendations to apply for membership and to purchase a lot, initially sold for $150 each. The location was touted as having unsurpassed mountain views, distant from smelters, with pure air and no saloons. Buyers were required to develop their lots according to a “tasty and artistic plan.” The Circle Railroad promised to extend tracks on the popular line east from South University Boulevard to South Milwaukee Street and run four trains per day. A few years later an electric line was extended to South University Boulevard and East Evans Avenue, followed by an electric trolley down Evans and Milwaukee alongside the Circle Railroad tracks. The Evans Store on the corner of Evans and Milwaukee served as a market, post office, and lively hub for the growing community. It is still standing, currently housing an insurance office. Chamberlin Observatory was completed in 1890 in the southern portion of Observatory Park. Designed by Robert Roeschlaub in the Richardson Romanesque style, it is still used by DU for astronomy classes, for star gazing, and by the University Park neighborhood for annual events. Since 1977, the State Historical Fund has awarded major grants to DU to help fund much-needed restoration work with matching funds provided by the University Park’s Chamberlin Observatory Restoration Committee, the Denver Astronomical Society, and by DU itself. The observatory was named to the National Register of Historic Places in 1980 and received Denver local landmark designation in 1994. Since 1977, the State Historical Fund has awarded major grants to DU, including a $200,000 grant in January 2006, to help fund much needed restoration work with matching funds provided by University Park’s Chamberlin Observatory Restoration Committee, the Denver Astronomical Society, and by DU itself. In 1892, Bishop and Mrs. Henry Warren purchased a full block of land at 2160 South Cook Street and built their showplace residence, Fitzroy Place, a carriage house, and gardener’s cottage, on the southern portion. The structures are University Park landmarks notable for their outstanding architecture and setting surrounded by abundant open space. Although the architectural plans were supplied by the Albany, New York, ofﬁce of Fuller and Wheeler, it is possible that local architects were also involved. The three-story home included 13 rooms and 12 ﬁreplaces, and was named to the National Register of Historic Places in 1975; both the mansion and the carriage house were designated as local landmarks in 2007. Today the building houses a private school, Randell-Moore School of Denver. Iliff Hall, at 2201 South University Blvd., was built in 1892 for DU’s first graduate department, the Iliff School of Theology. Although the school closed in 1900, it reorganized and incorporated as an independent instittution in 1903. The deed was transferred from Colorado Seminary to the Iliff School of Theology, and the school was officially reopened in 1903. Iliff Hall still houses the school, which was placed on the National Registry of Historic Places in 2006. University Park School was built in 1893 just east of the southeast corner of St. Paul Street and Iliff Avenue. Although additions were made and the original structure was demolished, the location of the school remains the same. Attendance at DU plummeted when the Silver Panic occurred in 1893. In 1900, Dr. Henry Buchtel was named Chancellor, and his remarkable fundraising skills rescued the school. In 1905 he and his wife built their California bungalow style residence, Buchtel Bungalow, at 2100 Columbine Street. Their home also served as the governor’s mansion while Buchtel served as governor from 1907-1909. The building was named to the National Register of Historic Places in 1988. Many additional historic structures exist in University Park, and are described in Don Etter’s University Park/Denver Four Walking Tours, published in 1974. The walks focus on early development from 1886 – 1910, and include 101 structures (some of which have been demolished). As the years progressed, University Park evolved from the remote enclave envisioned by its founders. Denver’s growth, modern transportation, and the area’s continued desirability all contributed to increased residential and business development. Throughout its history, the residents have been active stewards of their neighborhood, aware of the unique qualities that brought them here. 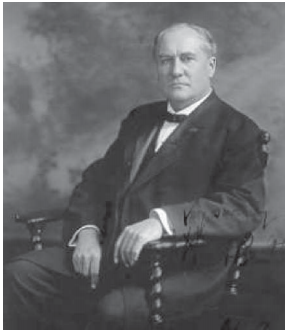 In 1923, community leaders enlisted notable landscape architect and city planner S.R. DeBoer to design a plan to help ensure the future of this special part of Denver. Although the plan was never fully implemented, portions of the plan can be seen in University Park today – planting of diverse street trees, a natural streetscape for parts of the eastern blocks, and a treed edge along McWilliams Park and on the DU campus. The concepts promoted by DeBoer – a “secluded nook, a quiet, peaceful part of the city,” encouraged by a lush greenscape, are relevant today. The planner noted in 1923 that the community was “in danger of losing its character as a beautiful residence district in Denver,” by encroaching development, and was being proactive in “planning its own neighborhood not for commercial benefit but for the protection of its homes.” Even prior to DeBoer’s vision, a 19th century “green plan” was drawn for University Park that showed “a method of parking the streets and avenues,” how and where to plant street trees. University Park’s Centennial celebration in 1986 included the dedication of Buchtel Centennial Park at Buchtel Boulevard and Columbine. Buchtel Boulevard was constructed on land donated by DU in memory of Henry Buchtel after his death in 1924, and trees were planted by the school. A trail was built on land bordering the linear boulevard in 1996. The property including the boulevard and land on which the trail was later built, from South University to Monroe Street was named to the National Register of Historic Places in 1992. Prairie Park was established along the area adjacent to the historic trail on land recently acquired from RTD. Plans currently call for planting native plants requiring little irrigation, recalling early days when the entire area was mostly a prairie.